Sometimes it can be tough to make the decision to sell grain today, not knowing what the market will do in the future. Or, maybe you’ve made a few sales already, but the market has shifted and you want to be a participant again. In either case, ADM’s Price Point contract allows you to sell grain with confidence early on, knowing that you can re-take control based on your market opinion. 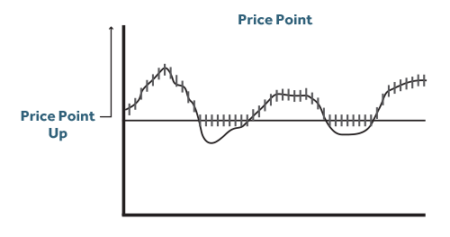 The Price Point contract offers the choice to participate in the market’s movement higher (Price Point – Up) or lower (Price Point – Down) relative to a Price Point that references a specific futures reference month. With both, you can decide how high or low to set your specific Price Point, and how much time going forward that you want to participate in the market. You decide to add a Price Point to a new or existing contract where the Futures Reference Price is already established. You choose the specific Price Point to reference, a defined pricing period, and whether to capture the upside – above your Price Point, or, the downside – below your Price Point. During the pricing period, prices will be captured to reflect the Price Point formula that you have chosen. 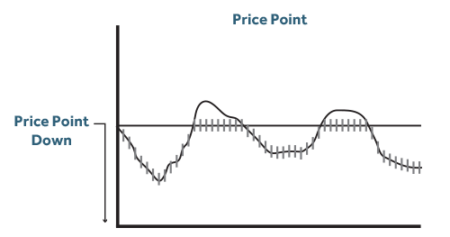 When the pricing period concludes, the Price Point Value (if any) will be determined: A) Price Point – Up Value: The average of the daily price references, minus the Price Point, and B) Price Point – Down Value: The Price Point, minus the average of the daily price references. Helps you manage market volatility. Allows you to participate in future market developments, even on existing contracts. With a Price Point – Up contract, the Price Point level is defined with the help of your local ADM rep. If the underlying futures reference market settles above the Price Point level, the market settlement price will be referenced for the daily pricing quantity on that day. If the underlying futures reference market settles at or below the Price Point level, the Price Point level will be referenced for the daily pricing quantity on that day. The average of the daily pricings is determined by summing the daily prices and dividing by the number of days in the pricing period. That average price minus the Price Point level determines what value, if any, will be added back to the contract. With a Price Point – Down contract, the Price Point level is defined with the help of your local ADM rep. If the underlying futures reference market settles below the Price Point level, the market settlement price will be referenced for the daily pricing quantity on that day. If the underlying futures reference market settles at or above the Price Point level, the Price Point level will be referenced for the daily pricing quantity on that day. The average of the daily price references is determined by summing the daily price references and dividing by the number of days in the pricing period. The Price Point level minus that average price determines what value, if any, will be added back to the contract.